Miss Justice - Expert Motoring Lawyer defending drivers nationwide: WATCH OUT - EVEN THE EASTER BUNNY CAN BE PULLED OVER BY THE POLICE?! WATCH OUT - EVEN THE EASTER BUNNY CAN BE PULLED OVER BY THE POLICE?! For some, it can be all too easy to let your guard down over the bank holiday weekend. With most people having 4 days off with their family and friends and with the nice weather that is predicted it may be too tempting to have the odd tipple or three! Also with Easter also signifying the end of Lent many will be looking forward to having that treat that they have deprived themselves of for the last 40 days, whether that’s alcohol or other indulgent treats. Not only do people tend to drink more, they drive more too. Many families, couples and friends will be setting off in their cars for UK breaks to make the most of the time off work together and hopefully the sunshine! Here at Geoffrey Miller Solicitors we want to make sure that everyone is safe and on the right side of the law this Easter. After all, even the Easter Bunny is not above the law! Last year in Detroit this bunny rabbit motorcycle driver was pulled over by the police for wearing his bunny costume that obstructed his view and of course he did not have a helmet on! 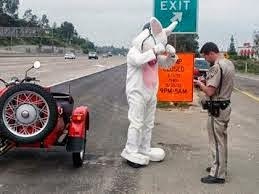 Even The Easter Bunny Is Not Above The Law! Here are our top five tips to make sure your Easter driving is a happy one! 1. YOU CAN’T BE TOO CAUTIOUS…. Be cautious that over indulging with alcohol can cause you to remain over the legal limit some 24 hours or more after your last drink. The “2 pints and you can drive theory” is completely misconceived and the amount of ‘acceptable’ alcoholic drinks is completely different from person-to-person. When you know you are drinking alcohol do not make plans to drive at all even if it is the next day and always plan your journey home in advance. With the traffic likely to be worse than usual, allow an extra 30 minutes to arrive at your destination on time. This will prevent road rage and the temptation to speed or jump a few amber lights. If you find yourself in that dreaded traffic jam on the M1 remember that you are still in control of your vehicle whether it is stationary or not. This means you still cannot use your mobile phone or any interactive communication device whilst the engine is still running. Before taking any journey on the motorway make sure your tyre pressures, tyre treads, oil and water levels are correct. This will avoid the risk of breaking down, potentially causing a road traffic accident and facing charges for careless driving and driving a defective vehicle. Most driving offences are endorseable with points or a ban and often a hefty fine. Again, on long journeys preparation is key. Set up your Sat Nav in advance and make sure any children in the back have toys or games to keep them entertained. You need to avoid as much distraction as you can to ensure you keep your eyes and mind on the road! If you do find yourself facing a motoring charge this Easter, our solicitors will be available to take your call and advice you of your options. Even if it’s just to put your mind at ease so you can carry on gorging on those Easter eggs! Our team is available throughout the Easter break on freephone 08000 85 27 84 and our website lists details of the personnel who will be answering the calls out of hours. We don't use a call centre but have members of our expert motoring law team on hand to assist you with your motoring queries day and night. Preparation is so important because you're bound to end up in traffic! Check the safety of your car, tyre pressure etc and have some snacks, water and blankets in the car just incase.